24 years ago, an event was born. Today, it is a reference in Puerto Vallarta and the Riviera Nayarit. Culinary puts on a show every November for the Festival Gourmet International. It is a fact. The Festival Gourmet International (the FGI) is here to stay. In 1995, chefs Thierry Blouet and Heinz Reize – from France and Switzerland, respectively – took the initiative to create an event that would strengthen the gastronomy of our region and promote the destination through culinary art. On these premises, they designed a festival whose format managed to capture the attention at an international level: each restaurant invites a renowned chef whose cuisine is outstanding and innovative. Throughout these years, chefs from several countries have been invited, the five continents represented. Six hotels and six independent restaurants participated in the first edition of the Festival Gourmet International. Progress during 23 years is notable: the growth and expansion to the Riviera Nayarit and Tepic have been a major reason. This year, 28 hotels and restaurants of the highest levels will participate, offering tasting menus or gourmet à la carte dinners. In addition, special events are held during the festival, such as themed dinners, gastronomic tours (where several restaurants are visited on the same night), wine fairs, forums and cooking classes with experts. This festival brings together great chefs from Mexico and the world to the delight of the most demanding diners. To date, more than half a million gourmet fans have been taken care of. Today the region is known as a world-class culinary destination and guest chefs decorated with Michelin stars are also joining us more and more. This year, Mozzamare Casual Beach Gourmet will be the home of Mexican chef José María Romo, better known as Chema, who leads the French-Vietnamese restaurant M Cocina Creativa in Zapopan, Jalisco. 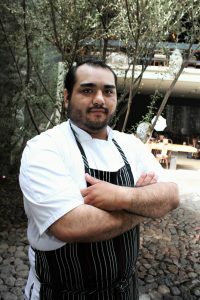 Chema Romo is a graduate of the Culinary Institute of Mexico, where he was part of the selection that represented the institution in various worldwide competitions. His culinary knowledge was enriched by internships in different restaurants in Spain, Singapore, Mexico and Chile. After returning to Mexico, he began his career as a professor in the state of Chiapas, where, together with a local university, he created an application restaurant and a research and development laboratory. This is where he conducted extensive research on local products, as well as uses and customs of this state in relation to its products. That is how he got to set the pillars of his culinary philosophy. His cuisine is based on seasons and regions, helped by the relationship he generates with the producers of the states he visits in order to find the best products. Nature marks the rhythms of his cuisine, adapting it to each season to make a global cuisine with fresh local products from the orchards, seas, farms, mountains and collector communities surrounding it. Chema Romo considers that gastronomy is a language and products are tools to create culinary and cultural expressions. Do not miss this opportunity to meet him and try his original creations from Friday, November 23rd to Sunday, December 2nd at Mozzamare Casual Beach Gourmet in the Festival Gourmet International.